The earliest known occurrences of lamprey in the fossil record go back over 40million years. Early lamprey fossils are remarkably similar to those lamprey species living today. This leads scientists to believe that existing lamprey species have not evolved very much in all that time. The fact that these fish lack scales, bones and jaws indicates that they are very primitive on the evolutionary ladder. They are amongst the least developed vertebrates (animals with backbones), and represent the earliest stages of vertebrate evolution. Shaped like an eel, their skeletons are made of cartilage instead of bone. Instead of a jaw, their mouths are sucking discs. Essentially they are living fossils, giving us an accurate glimpse of underwater life millions of years ago. In Ireland there are three native species of lamprey; brook lamprey, river lamprey and sea lamprey. 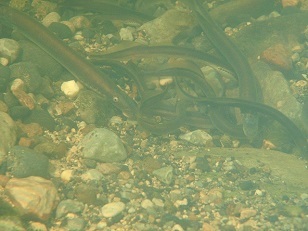 Lamprey spawn in rivers and streams, with high water quality and clean gravel beds. Upon hatching, lamprey larvae, known as ammocoetes move to silted nursery grounds where they filter food from the water. Here they grow and develop until they metamorphose into adults. River lamprey and sea lamprey migrate to sea as adults where they feed on the blood of other fish. In contrast, brook lamprey do not leave the freshwater environment and do not feed as adults. The River Blackwater and its tributaries have been designated as a Special Area of Conservation for all three species. The species rely on high water quality and clean gravel to reproduce. Barriers to their migration such as dams and weirs can also be detrimental. Raptor Life is working on improving lamprey spawning habitat in the SAC by reducing erosion of riverbanks and reducing nutrient input from agriculture. This is achieved through fencing of riverbanks, removal of invasive species, exclusion of livestock and restoration of riparian vegetation. IRD Duhallow is proud to play a role in the conservation of these curious living fossil, creatures.